Dyscalculia is a brain-based condition that makes it hard to make sense of numbers and math concepts. Some kids with dyscalculia can’t grasp basic number concepts. They work hard to learn and memorize basic number facts. They may know what to do in maths class but don’t understand why they’re doing it. In other words, they miss the logic behind it. Other kids understand the logic behind the maths but aren’t sure how and when to apply their knowledge to solving problems. Dyscalculia goes by many names. Some public schools refer to it as a "mathematics learning disability." Doctors sometimes call it a "mathematics disorder." Many kids and parents call it "maths dyslexia." Your child’s struggle with maths can be confusing, especially if he’s doing well in other subjects. This can lead to anxiety and low self-esteem. But parents have the power to change that equation. There are many tools and strategies that can help with dyscalculia. The trick is finding the ones that work best for your child. Dyscalculia is a lifelong condition, but that doesn’t mean your child can’t be happy and successful. 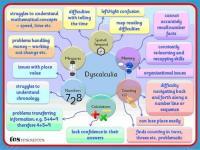 Dyscalculia can affect many different areas of maths learning and performance. Different kids have different challenges. The most common problem is with "number sense." This is an intuitive understanding of how numbers work, and how to compare and estimate quantities on a number line. Most researchers agree that number sense is at the core of math learning. If kids don’t understand the basics about how numbers work, learning maths and using it every day can be very frustrating. Dyscalculia is now a recognised type of specific learning difficulty, although less is known about it compared with dyslexia. There is now substantial evidence showing that people experience a range of specific difficulties with the learning, retention and application of mathematical skills and related reasoning abilities. It would appear that dyslexia and dyscalculia can be co-occurring conditions, although each can exist without the other being present. To assess for the presence of dyscalculia/maths difficulties it is important to investigate a range of underlying ability areas - such as working memory, language, visual reasoning, and information processing - to appraise a person's profile of strengths and weaknesses. Literacy and mathematical skills also need to be assessed jointly to make judgements about the extent and severity of a person’s difficulties. It is always important not to pre-judge the nature of a person’s apparent learning difficulties and so the assessment framework needs to be dynamic and enquiring in style. There is a considerable body of research to indicate that children, young people and adults with dyscalculia/maths difficulties can respond positively to well-organised teaching inputs from suitably qualified and experienced teachers. 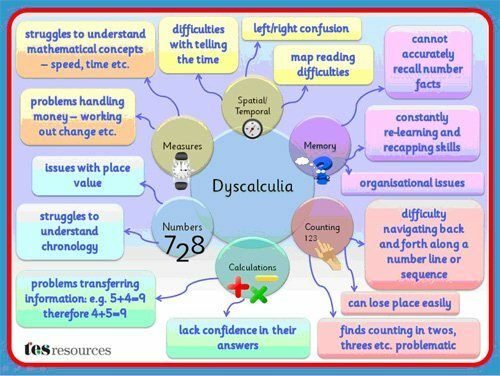 These inputs often don’t have to be extremely specialised and sometimes it is difficult to distinguish ‘dyscalculia’ from the sorts of common mathematical difficulties that everyone experiences from time to time in their learning. This is particularly true for young children within KS1 and KS2. What is important is that a person’s particular weaknesses and strengths are identified and that an individual programme of support is carefully designed, implemented and monitored over time by a skilled teacher. A number of Dyslexia Action’s Learning Centres can provide high-quality teaching to support those with maths difficulties. We also offer a range of dyslexia assessments. A full diagnostic assessment, carried out by a specialist assessor will identify strengths and areas that require support. The assessment can identify dyslexia, another specific learning difficulty such as dyscalculia, or that no specific learning difficulty exists. Whatever the outcome, recommendations are provided to help with the most appropriate way forward. If you’ve been told your child may have dyscalculia, or if you suspect your child has it, you may wonder how to help him. Dyscalculia is a learning issue that causes serious maths difficulties. It isn’t as well-known as dyslexia. However, some researchers now think it may be almost as common. Fortunately, there are many ways you and teachers can help your child. Whether it’s strengthening maths skills or boosting his self-esteem, there are steps you can take.